Air pollution is one of the most pervasive environmental health issues, and one that remains mostly invisible. Here is where the work of artists can help reveal a hidden world, translating data as well as breaking open the politics of managing this global commons, using their art as a platform for debate. While carbon dioxide is the most talked about air pollutant and most famous greenhouse gas, its production is often accompanied by a whole cocktail of local, regional and global nasties. The works profiled here also cover that spectrum, helping us address how we can change our ways. 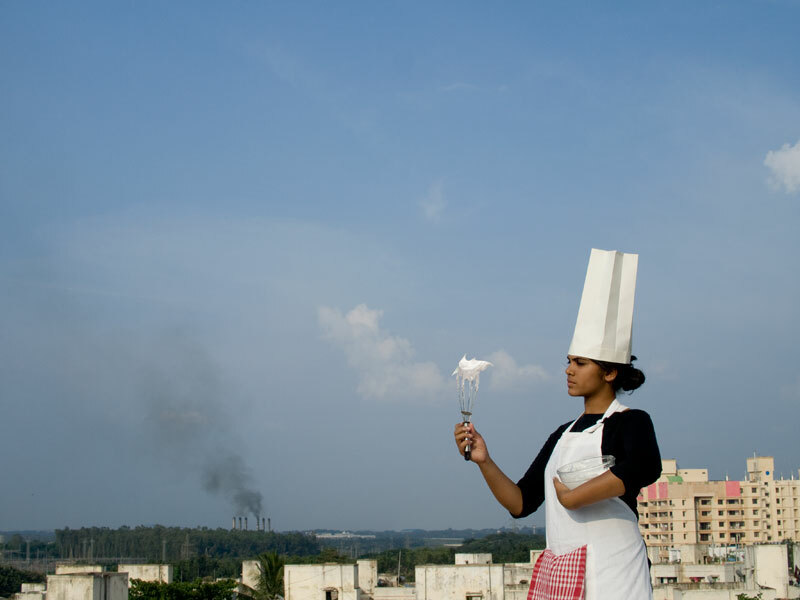 The Centre for Genomic Gastronomy brings us this playful pubic performance around the serious issue of heavy air pollution in Indian cities. By whipping up egg foams in different busy street corners of Bangalore and making them into cookies, one could literally test and taste for different pollutants. As the artists Zack Denfield and Cat Kramer (of CGG) put it “The tragedy of the commons never tasted so good!”. They are also at pains to point out that eating these toxins is no more harmful than breathing them, something city residents do all the time without thinking. Like a Trojan horse these ‘smog cookies’ brought new attention to a mostly invisible issue. In the Air is a project which visualises environmental pollutants in the urban environment, as a platform for collective awareness, decision-making and political action. Initiated in Madrid, by Media-Lab Prado, it has since been replicated in Santiago de Chile and Budapest. 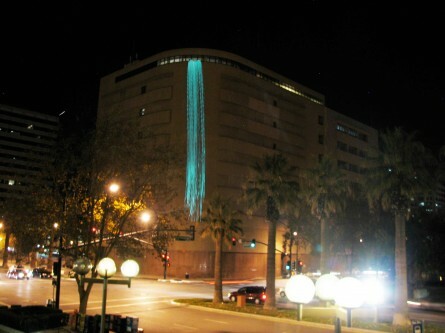 Particle Falls is the work of artists Andrea Polli and Chuck Varga, which visualises real-time small particulate matter air pollution (PM 2.5) in downtown San Jose via the changing scale of a laser light cascade on the side of a city building. The work is made possible through the AirNow project which shares live air pollution data throughout the US. It aims to raise awareness amogst the public of air pollution and thereby encourage behavioural change. The piece is also accompanied by a real time web visualisation. 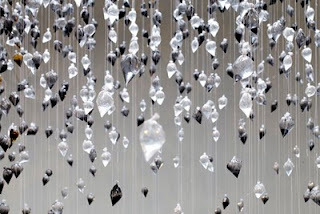 Nigerian artist Ugochukwu Eke�s work ACID RAIN, produced for the RETHINK exhibition in Copenhagen 2009, consists of 6,000 hanging plastic bags. They sparkle, grey, clear and black, like Christmas decorations, but they contain carbon dust – currently choking the inhabitants of the delta region of Nigeria, an area of massive oil exploration. His work focuses on complete disregard for the environment by authorities and individuals. With the advent of pervasive data and new sensing technologies artists have quite literally become barometers, seizing upon new materials and techniques to create instruments to measure and translate the natural environment.